Ginger and Todd love Wyoming and after years of vacationing here, they made the leap and moved last year. They decided to tie the knot at the historic Eaton’s Ranch with a weekend long celebration surrounded by family and friends. We planned on a long farm table decorated with a flower studded garland and a traditional round bouquet full of ruffled peonies and roses in shades of purple for the ladies. I made a few cuff corsages with deep purple ranunculus and a traditional white rose boutonniere for the groom with a touch of lavender - a nod to their long time home in the midwest near a lavender farm. Ginger requested traditional round bouquets in shades of white, lavender and purple with minimal greenery. It was a fun change from my wild and loose greenery bouquets and I LOVED them. For the bride I used pure white peonies grown in Colorado, white freesia, lavender roses and hellebores. For their dinner in Howard Hall we lined the long table with garland and studded it with roses for dinner. The Cake Chix brought a gorgeous naked cake that we added greenery and a few flowers to along with their custom made spurs! We draped the old rock mantle with more greenery and a few small rose arrangements for a pop of color. These two grew up in Sheridan but fell in love while living on the East Coast. 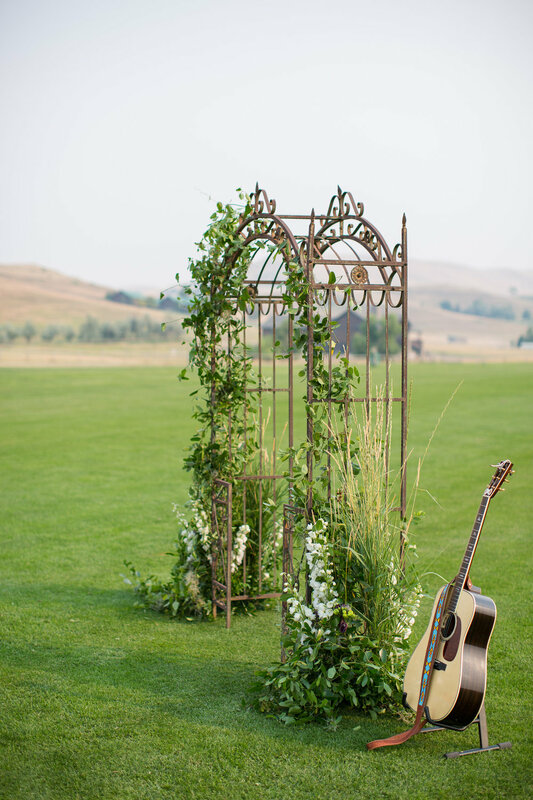 They came home for a celebration with their families and friends for a late summer wedding with a mountain and prairie theme. With lavender and dried prairies grass as our color scheme, I had free reign to bring in all the lovely textures August has to offer. It was a treat to wander a piece of property owned by the bride's family and pick native grasses and other local greenery to mix into her bouquet. In all, the bridal bouquet featured over 20 different flowers, grasses and other greenery including lisianthus, Sahara roses and eucalyptus. They hosted a sweet ceremony on the Polo Fields at the Big Horn Equestrian Center followed by dinner and dancing under the lights. Even with the heavy wildfire smoke in the background the day was a beauty.